In 1966, the Army devised a new specification for a Combat Vehicle Reconnaissance (Tracked) or CVR(T). In 1967, after plans were submitted by the manufacturers, Alvis was chosen to produce a 30 vehicle prototypes preseries. The latter were called P1 to P17 and delivered on schedule and budget, these were sent to be tested at home, and then abroad, in the most severe conditions, in Norway, Canada but also Abu Dhabi and Australia. After corrections by the manufacturers, the Scorpion was accepted for service in may 1970 and ordered to 275, then 313 units to Alvis Vehicles Ltd at Coventry. The first rolled off the line in early 1972. Only 1500 would equip the British army, while around 1500 more were built for the export market and were (or are still) in service with twenty-one more countries. 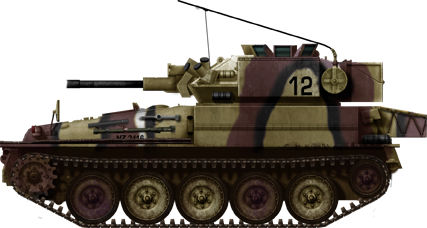 The Scorpion is a simple vehicle apparently on the straight line of British light tank design, with the engine on the front and turret/fighting compartment on the rear. Apart from the nose which is rounded, there is a well-sloped front plate, with a beak. The sides were also slightly sloped and counted strappings and fasteners for external equipment and tooling. Short mudguards circling the upper hull, while the drivetrain was made of two front drive sprockets, two rear idlers, and six rubberized roadwheels suspended on torsion bars. The turret was also well-sloped to a great angle and counted a single rotatable commander cupola with height prismatic blocs. The armor was limited to 12.7 mm, and in aluminum, so the overall weight was limited to just 8 tons. A special coating was applied inside to cope with a possible hit which would have made the aluminum hull prone to burn quickly. The hull was completely sealed, proven NBC (Nuclear, Chemical, Bacteriological protection) and equipped for semi-amphibious crossings, with flotation screen deployed. The engine was at first the Jaguar J60 4.2-litre petrol engine but a diesel was chosen later during production to increase range. The final one was the Cummins BTA 5.9-litre capable of 190 hp, or a Perkins equivalent. Trials showed that top speed was 50 mph (80 km/h), and it was up to accelerations from one to 30 mph (49 km/h) in just 16 sec. In water, this was reduced to 3.6 mph (5.8 km/h). The engine was served by a David Brown TN15 transmission. The armament comprised the main ROF (Royal Ordnance Factory) 76mm L23A1 gun, tailored for the Scorpion in 1973, which could be fed with various ammunition, ranging from HE to various AP rounds. It had a 6 rounds per minute rate of fire and an effective range of 2,200 m (2,400 yds). This was completed by a Coaxial 7.62 mm L43A1 machine gun, fed by 3000 cartridges, including tracers. Other equipment included a wireless radio, image intensification sights for the gunner and driver and IF vision. Internal commodities comprised a commander’s commode under his seat, a water tank and a boiling vessel. Most of the changes occurred in the engine, and external fittings. There were no marks, and export models were very close or identical to the original design. The Irish-based company IED also proposed to modernize the Scorpion fleet using the more powerful Steyr M16 TCA HD engine, and the gun was upgraded to a 90 mm, hence the name, Alvis Scorpion 90. The long-barrelled Cockerill Mk3 M-A1 90mm version was intended first to feed the export market and keep Alvis lines running after the British orders have been delivered. 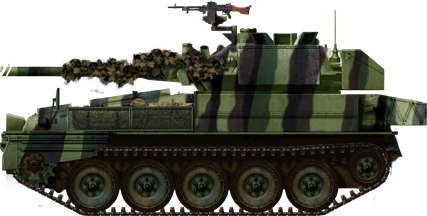 The Scorpion was close or served as a common platform for a long line of armored vehicles. Its sister CRV(T) was the FV107 Scimitar (1971), nearly identical but equipped with a high velocity 30 mm L21 RARDEN cannon firing sabot, HE, and APSE rounds. There were also derivatives like the FV106 Samson light ARV (1977), the FV102 Striker (1976), light tank hunter firing Swingfire wire-guided missiles, the FV103 Spartan APC (1978), the FV104 Samaritan ambulance, and the FV105 Sultan mobile HQ. Extra turrets from discarded Fox reconnaissance vehicles were later fitted to the Sabre CRV(T) reconnaissance vehicle, making a sub-variant in 1995. However, it was not deemed successful and retired from service in 2004. The Alvis Stormer AT version, carrying Starstreak High Velocity Missile system was also tested, as well as a minelaying version. The not well-known variant Salamander is used by the OPFOR in Canada as a dummy T-80 for training today. In Europe, the major operators outside the UK and Ireland (19) were Belgium, which ordered 700 units plus a demonstrator, now retired, and Spain. (An unknown number were used by the Spanish Marines until 2009). In South America, users were Bolivia (20), Chile (30, by the Marines), Honduras (19), and Venezuela (78). In the middle east, Iran (130, plus a local modernized version Scorpion 90 called the Tosan, equipped with the Toophan ATGW system), Jordan (80), Oman (120), and the UAE (76). In Africa, Botswana (60), Nigeria (80), Tanzania (40), and Togo (12). In Asia, operators were Brunei (16), Indonesia (100), Malaysia (26), The Philippines (65), and Thailand (154). Most of these vehicles were the late Scorpion 90 variant. The first to receive the Scorpion were the Blues and Royals Regiment of the Household Cavalry in 1973. This vehicle then gradually equipped all British reconnaissance units. The special RAF Regiment received also 184 Scorpions in 1981. B Squadron, Blues and Royals was involved in the operations during the Falkland wars in 1982. In 1990, the 1st Queen’s Dragoon Guards and the 1 Squadron RAF Regiment, both attached to the 1st British Armoured Division participated in the first gulf war. Iranian Scorpions were supposedly engaged during the Iran-Irak war of the 1980s, but few details are known. Total production 3,000 in 1972-85. Alvis Scorpion of the British Army with the typical OTAN camouflage, 1975. Alvis CRV(T), without the turret storage. Alvis Scorpion, Blues and Royal regiment, B squadron of the Household cavalry, Falklands 1982. Alvis Scorpion featuring an urban camouflage, 1980s. 7th Brigade Royal Scots, Operation Desert Storm, Irak, feb. 1991. FV101 now preserved at Adlershot. A New Zealand FV 101. The standard export Scorpion 90, with the typical four-tone “jungle camo” used by some countries. Is this vehicle still relevant?